Have you ever seen this road sign, or one like it? It’s a road sign from a state highway in New Mexico, one of several that alert drivers in that state to the dangers that occur when a severe dust storm occurs. 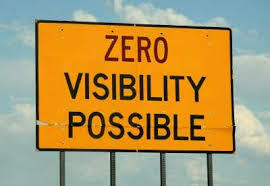 Scary when you think about it – driving conditions so poor that there is literally zero visibility. This is a driver’s worst nightmare – and gives cause to the term ‘driving blind’. No idea what lies ahead, and perhaps even more fear of what may come up from behind. Just the thought sends goose bumps up my back. For grins, I ‘Googled’ what to do when driving in a dust storm. As you would guess, advice all points to one logical approach: pull over, stop the car, and wait it out. The storm will eventually pass. Or at least you hope so, right?